When in Goa, who can resist the lure of a good burger with that beer? In fact, Goa, being one of the few states where beef is served without much contention, is home to some of the juiciest burgers. And before the vegans and vegetarians check out, we promise at least two delicious burger options for you too! Located at the heart of Anjuna, Burger Factory has oodles to offer. Choices range between beef, pork and chicken, with a palate of savoury drinks. Their beef burger with pomegranate, guacamole and cheddar will leave you satisfied yet yearning for more. And for those of you that have trouble choosing, they do specials on Thursdays — pulled pork plus a beef or pork patty! Also, their fries. 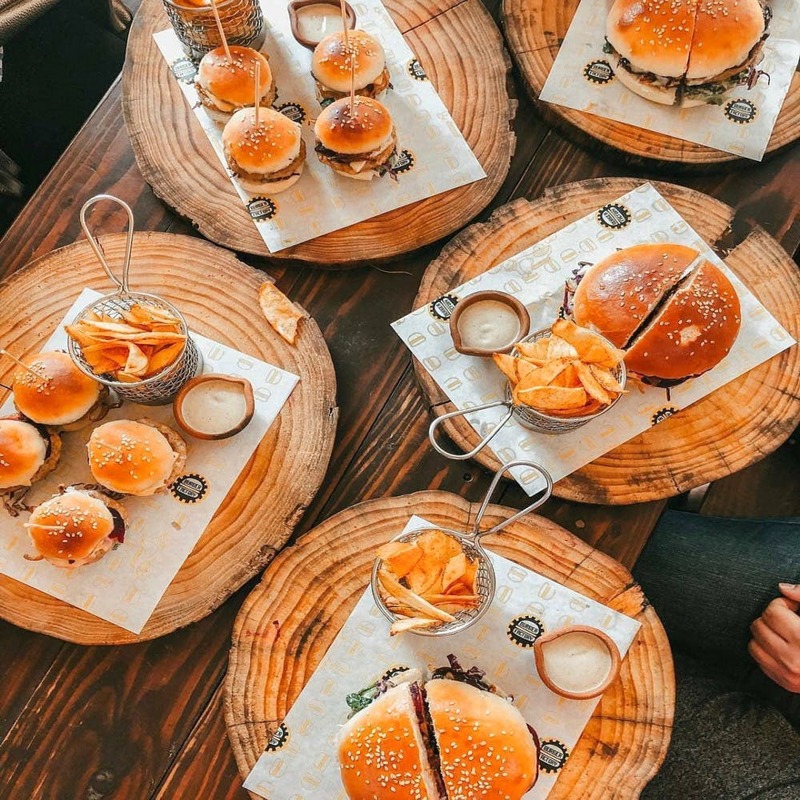 With a grungy garage like feel, and a smoke-house set up where their meats and veggies are smoked at least for a minimum of six hours, Cubebar serves the classic messy burger. Their obsession with the grills is so intense that they actually created their own smoker from an old water tank. Their burgers come with home cut chips which are spiced with a secret sprinkle of their in-house masala. Head here post 6pm and wash down the burgers with some yummy cocktails — all made from scratch. Vegetarians, their smoked mushroom and beetroot burger is our favourite. Located just off the Rua de Ourem creek, Route 66 offers some of the best burgers in Panjim city. The LSD Burger, lives up to its name and will leave you in a post foodgasm daze — it comes with grilled beef patty, large helpings of chipotle chilly sauce, BBQ sauce, pickled jalapenos, cajun spice, crispy bacon which is finally topped with succulently pulled hickory BBQ pork ribs! Their 4oz pork patty along with the crispy bacon and melted cheese is another favourite. Go here for juicy beef burgers with names like Space Cadet which comes with gherkins, roasted peppers, and onions; as well as the regular Hans Solo classic. Each of their burgers is a must try — they have chicken and veg options as well. Visit Rocket on a Wednesday or Friday night to enjoy some live music while you wash down the burgers with some beer! Definitely try their homemade Rocket sauce to go with. The burger — Hercules, is right there on the top of the list of their most sought-after meals, alongside the homemade croissants. You can choose between a chicken and a beef patty, which is then topped off with bacon, grilled onions, and a fried egg. Aptly named, the burger is quite a mouthful, but is sure to leave you wanting for more. Try their homemade dip to add an additional zing. Vegans and vegetarians ahoy — the tofu burger at Bean Me Up will be right up your alley, while non-vegetarians, this burger will leave you scratching your heads because you never thought a veg burger could taste this good! Made from fresh tofu, lettuce, tomatoes, onions, sprouts, mustard, vegan mayo, (or tofu naise) along with a dressing of your choice, the burger is served with whole wheat pita bread, or a burger bun. This burger hits the spot after one of those long nights of drinking!